I used to keep a sock box for lone socks. It sat by the washer and dryer. I'm pretty sure some socks sat in that box for more than a year. Before that I kept a pile on my dresser. The laundry always felt half done because of these lingering socks. One day, I read about not keeping a sock box. The idea was to have a zero tolerance policy for lone socks sitting around in a pile (or a box). When we moved, I did away with the box and I started putting lone socks in the drawers with other paired socks. All the loose socks have a home in their wearer's draw even if they don't have a mate. And you know what? It seems like their matches find their way home more often. The best part is I don't have a junkie sock pile or box. It's tidy and makes me feel like there are not so many loose ends with the laundry. What do you do with lone socks? same!!! They always seem to find their mate, and if they don't, then I cut their tip off to remind me it's an orphan sock, and I stick it in with the rags. We use it for a dirty job that shouldn't be washed (bike grease, blood, grill grease, etc.) and then I throw it away. I've seen cute crafts with orphan socks as puppets, and I once made a bun thingy for my hair with an orphan sock. But really, I don't usually bother. 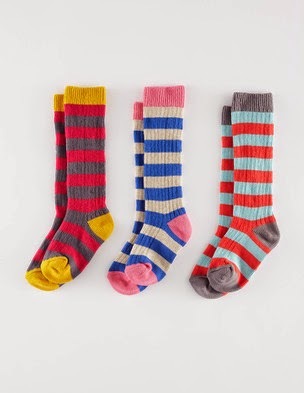 LOVE those Boden socks! orphan sock - ha! i've never heard that term. I think I'm going to collect them in a box and ship them to your house to look for their mates. Actually I'm a big believer in safety pinning all my socks together when I take them off. I still have some loners , but a lot fewer than previously. Another solution is to only buy one color and one brand of sock , but you don't make much of a fashion statement when you do that plus you can never seem to find the exact socks that you bought before. This is an eternal problem that the inventor of the sock did not forsee. Boden socks are adorable. Always love your posts, SB! Lone socks are so annoying. Especially my husbands dress socks that are different shades of grey/blue and they don't match up. THAT is the most annoying thing ever. Sometimes I pair them together anyway and he always notices (haha). Yeah, I have the lone sock basket on my laundry folding table but I like your idea better. But when do you clean out the sock drawer and throw out the lone socks? Or is it out of sight, out of mind? out of sight out of mine for a while. i eventually throw them away. Lately, my children have been cutting our loners apart and sewing bean bags. So, you just put the socks in the sock drawer anyway? Does that create more disorganization? Or is it, "out of sight, out of mind?"